Zamora is located in the region of Castilla y Leon in northern Spain near the border of Portugal. Many battles took place in this part of the country leaving an area that is very rich in history with lots of castles and imposing fortresses. However, this is also a area known for its great beauty, filled with picturesque villages, many beautiful lakes and rivers as well as some excellent wineries. Zamora is located along the Duero River which flows between Portugal and Spain. Dating back to Roman times, the city is extremely majestic looking with stunning buildings dating back to the Middle Ages. The 12th century Puente de Piedra stone bridge that crosses the river leads into the city. Among the stretches of wall that surround the historical part there are three gates called the Portillo de la Traicion, Puerta de Dona Urraca and Puerta del Obispo. Between the 8th to the 11th century many battles took place between the Christians and the Moors, and Zamora became quite a strategic town for the Christians in maintaining their position. Later it was dubbed by King Henry IV as the most noble and loyal city. However the battles continued long after the Moors were gone, with Kings and their heirs fighting to gain control of the crown of Castilla. King Sancho II of Castille was actually murdered in Zamora following an act of treason by one of the nobles. An event that was remembered by the ‘Gate of Treason’. The castle in Zamora is an imposing building with a moat, entrance gate, and pentagonal tower. Today is used for conferences and is currently being restored. One of the city’s most interesting sites is the Cathedral which is beautiful both inside and out. It has an impressive collection of Flemish tapestries and artwork that spans over many centuries. There are over 20 Romanesque churches in Zamora which is why it has become such an important city for Romanesque architecture. 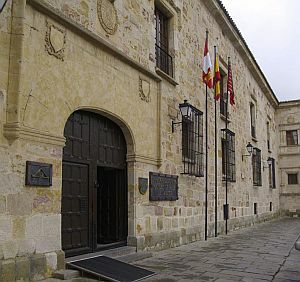 The town also has several museums, most of which relate to religious art, and the Museum of Zamora is housed in the Cordon Palace. The Palace of the Counts of Alba de Aliste is another fine example of Renaissance architecture, and has since been converted into the Parador Zamora (Hotel Condes de Alba y Aliste). This luxury four star hotel has a garden, seasonal outdoor swimming pool, and an excellent restaurant serving regional and international cuisine. Many of the bedrooms have four poster beds, which definitely makes it a bit of a treat if you are looking for somewhere special to stay. The best time to visit Zamora is at Easter when they celebrate the Festival of International Tourist Interest. Or during the summer months visitors are guided around the city by the medieval legends of the Romancero. The town of Benavente is directly north of twon and also exciting at Easter time as its main festival, called the Toro Enmaromado, lasts a week and includes lots of music and bullfighting. There are many other wonderful day trips you can make from that are all within easy reach. Toro is the place to go if you want to sample some of the region’s best wine, and Salamanca is directly south and an exquisitely beautiful city. Northwest of Zamora is the charming village of Puebla de Sanabria with a castle, beautiful Town Hall and church. Fermoselle is southwest and is a medieval village right on the border of Portugal. 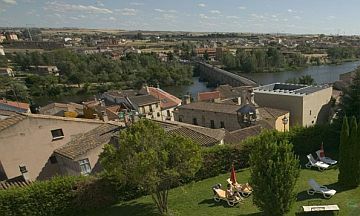 It has lovely views over the Duero River and many narrow streets both above and below ground. With almost 1000 underground caves connected by a maze of tunnels, the caves are still used today as cellars and here you can sample many of the region’s superb wines. For those who enjoy a more outdoor activity style holiday, there is swimming or boating on Lake Sanabria, hiking in the mountains of Culebra, and even an opportunity to play a round of golf at the Vallarin Golf Course. Bird lovers will enjoy the Arribes del Duero Nature Park which is located along the Duero River as there are cruises along the river that enable you to observe the reserve’s magnificent birds such as the eagle, falcon and owl. So there is literally something for everyone when you visit Zamora and this stunningly beautiful part of northern Spain.